Free Clinic of Meridian Receives National Grant!! 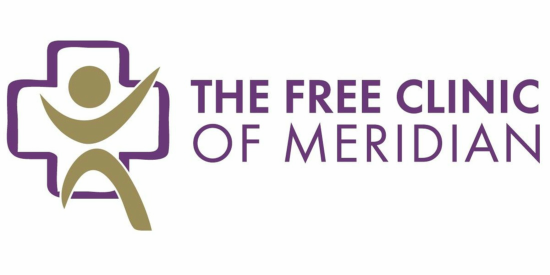 The Free Clinic of Meridian is among 25 clinics selected by Direct Relief, BD (Becton, Dickinson and Company) and the National Association of Free & Charitable Clinics (NAFC) to take part in the Continuity in Care Grant Program. The program provides funding for programs which will allow NAFC member organizations to continue or expand their ability to provide much needed health care for the medically underserved in their communities. The Free Clinic of Meridian received a $10,000 grant from the program. "As first year members of NAFC, the Free Clinic of Meridian is honored to have been chosen from among more than 250 applicants for this grant award," said Board President Casey Haarala. The Free Clinic of Meridian provides free medical care for more than 900 uninsured adults who are ineligible for Medicare or Medicaid and earn less than 200% of the Federal Poverty Level. “Across the United States, our Free and Charitable Clinics and Charitable Pharmacies are dedicated to providing affordable, accessible health care in their communities,” says NAFC President and Chief Executive Officer Nicole Lamoureux. “Direct Relief and BD should be commended for their commitment to provide critical operational support to our members and in turn, our patients. Their dedication shows a clear understanding that philanthropy can truly change and save lives.” These general operating support grants may be used to cover day-to-day activities or ongoing expenses such as salaries, utilities, office supplies, medical supplies, dental supplies, pharmaceutical supplies, technology maintenance, rent, expansion of services, project costs, technology purchases, and professional development. The National Association of Free and Charitable Clinics (NAFC) is the only nonprofit 501c(3) organization whose mission is solely focused on the issues and needs of the medically underserved throughout the nation and the more than 1,400 Free and Charitable Clinics that serve them. Founded in 2001 and headquartered near Washington, D.C., the NAFC is working to ensure that the medically underserved have access to affordable quality health care and strives to be a national voice promoting quality health care for all. The NAFC has earned the Platinum Seal of Transparency from GuideStar and a Four Star Ranking with Charity Navigator. For more information about the NAFC, please visit www.nafcclinics.org. Follow the NAFC on Twitter at https://twitter.com/NAFClinics and on Facebook at https://www.facebook.com/NAFCClinics. 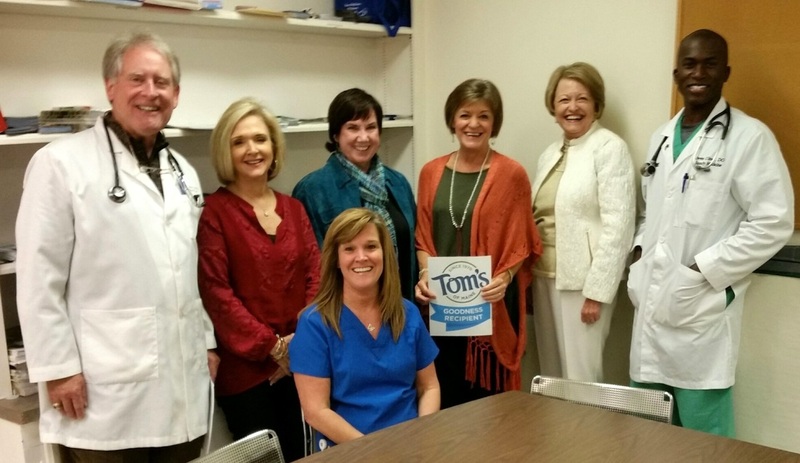 Meridian, MS, December 3, 2015 – The Free Clinic of Meridian has been selected as one of 52 winners from across the country in the seventh annual Tom’s of Maine “50 States for Good” community giving program. The organization will receive $20,000 to fund important community projects and services that will provide free medical care for uninsured adults in our area. 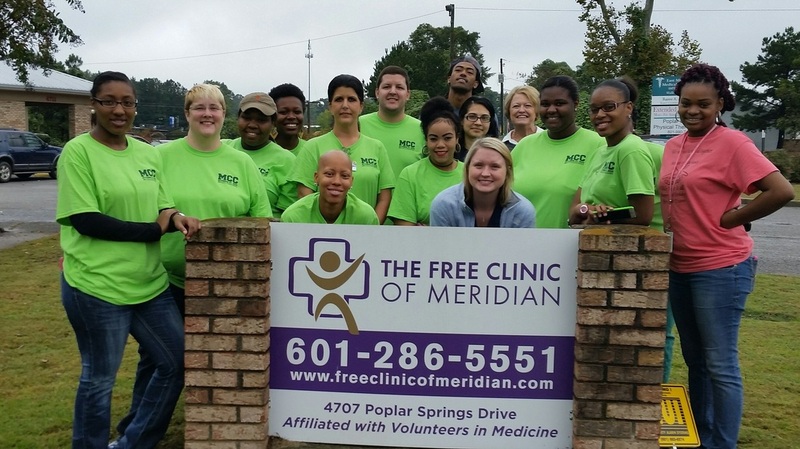 The Free Clinic of Meridian, located at 4707 Poplar Springs Drive, offers primary medical care for uninsured adults. All care is provided by volunteer physicians and nurse practitioners, who, along with nurses and front office volunteers, have given more than 5000 hours of time in 2015. The Clinic is open on Mondays from 1-4:00, Tuesday and Thursday evenings from 5-8:00, and Wednesdays from 9-1:00. Patients are seen by appointment only after approval of their applications. Passionate community members took to their social media pages to share #OneWaytoHelp their communities, amassing nearly 10,000 submissions. One entrant representing each state and Washington, D.C. was selected to designate a local nonprofit in their area to receive project funding from Tom’s of Maine. Tom’s of Maine has given 10% of profits back to the community since 1970 and encourages employees to use 5% (12 days) of paid time off to volunteer every year. For more information, visit www.tomsofmaine.com. The Free Clinic of Meridian has been open for just over one year and provides primary medical care for more than 500 patients. Applicants must provide a picture ID, Social Security Number, and proof of income, which cannot exceed 200% of the Federal Poverty level for the household. All applications are verified and appointments are made based on medical need. For more information about the Clinic’s services or to volunteer, visit us online at freeclinicofmeridian.com, the Free Clinic of Meridian Facebook page, or call 601-286-5551. Free Clinic Volunteers celebrate being the Mississippi recipient of a $20,000 award from Tom’s of Maine’s “50 States for Good” programs. Standing from left: Dr. Lee Valentine, Helen Valentine, Lean Follett, Robin Thompson, Brenda Hiatt, and Dr. Owen Ulmer. Seated, Donna Page. A huge thank you to the MCC Medical Assistants students and Alliance Health Center employees who scraped and sanded and scrubbed the outside of the Clinic in preparation for painting as a part of the Day of Caring! Now, who would like to volunteer to do the painting??? 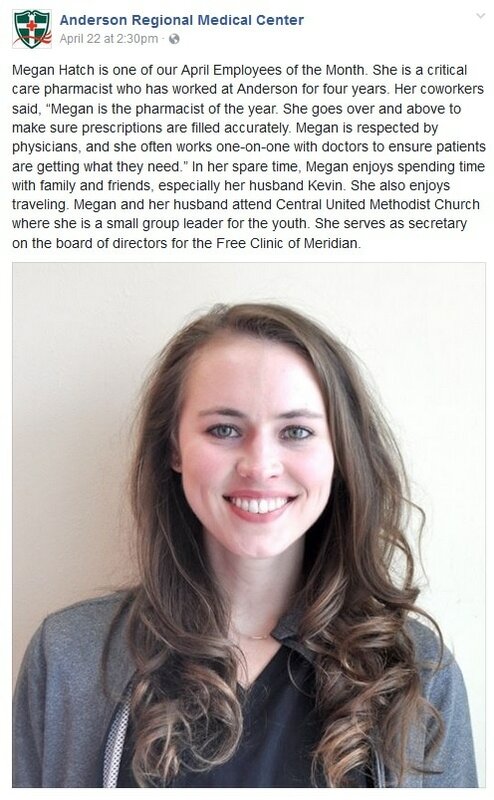 The Free Clinic of Meridian Board of Directors is losing two of our most valuable members as they move on to new life adventures. 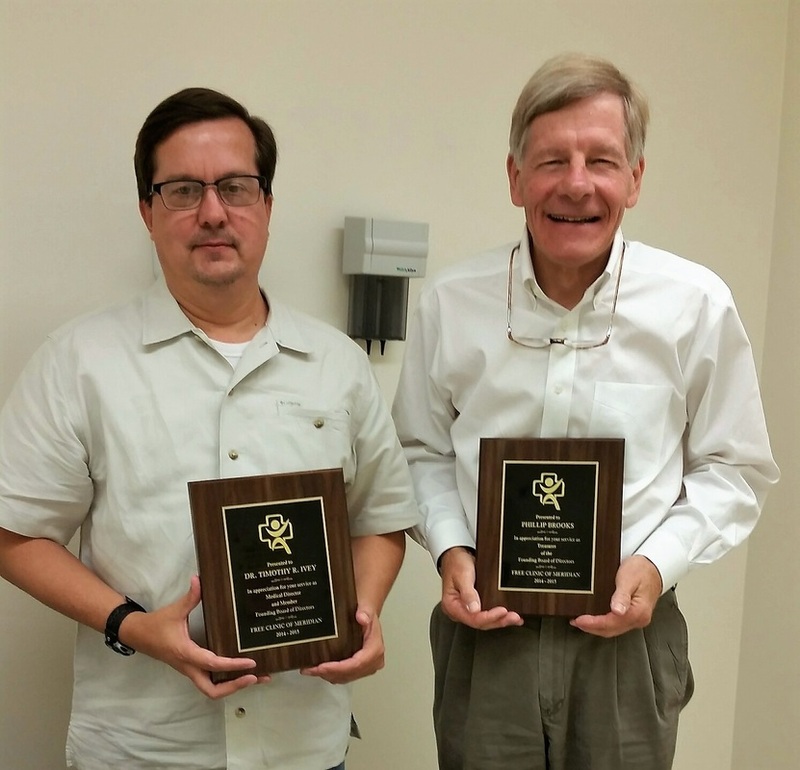 The Board honored Dr. Tim Ivey, left, who has served as our Medical Director, and Phil Brooks, right, who has served as Treasurer of the Board, during our Board meeting on Monday, September 14. We will miss you both. Your contributions have played a huge role in the success of the Free Clinic during our first year. We wish you all the best in your new adventures!